The New York Giants were 2-0 as they traveled to Washington to face the Redskins on October 8, 1950. The Giants were coming off of three straight mediocre seasons since last topping the NFL’s Eastern Division, but an infusion of talent that was mainly due to the demise of the All-America Football Conference was making a difference for the better. 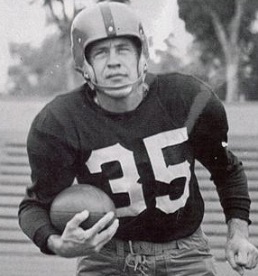 It was especially true on defense, and long-time Head Coach Steve Owen’s “umbrella defense” had shut down the powerful Cleveland Browns, newcomers from the AAFC, the previous week. Washington, coached by Herman Ball, was at 1-2 and didn’t appear to offer much of a challenge. HB Bill Dudley was a fine all-around player and end Hugh Taylor a quality receiver, but aging star QB Sammy Baugh was injured and inconsistent Harry Gilmer was starting in his place. After defeating the lowly Colts in the opener, they had lost badly to the Packers and Steelers. It was a rainy day with a light crowd of 19,288 fans in attendance at Griffith Stadium. In the first quarter, the Redskins drove 80 yards, keeping the ball on the ground, and Gilmer finished it off with a quarterback sneak from less than a yard out for a touchdown. Bill Dudley added the extra point for the early 7-0 lead. 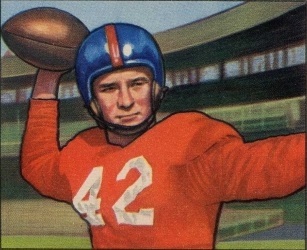 The Giants responded with a 70-yard possession that ended with HB Forrest Griffith, who ran effectively along the way with gains of six and seven yards, scoring on a two-yard plunge. Ray Poole tied the game with the point after. In the second quarter, the Redskins got a break when HB Jim Ostendarp fumbled a punt and DT Paul Lipscomb recovered, giving Washington the ball at the New York nine. Two plays later, Gilmer threw to Dudley (pictured below) for a four-yard TD and Dudley also added the extra point to make it 14-7, which remained the score at halftime. In the third quarter, New York QB Charlie Conerly (pictured at top) passed to end Bob McChesney to reach the Washington 13 and the Giants pounded away on the ground from there until HB Gene Roberts blasted over from two yards out for a touchdown. Poole again added the extra point and it was a 14-14 contest. The Redskins had an opportunity to regain the lead when Dudley kicked a 22-yard field goal, but they chose to take the points off the board due to an offside penalty on the Giants that gave them a first down at the New York 11. However, they were unable to reach the end zone and, once again calling upon Dudley to try for three, came up empty when he missed. Dudley didn’t miss early in the fourth quarter when he kicked a 19-yard field goal to make it 17-14 in favor of Washington. Down by three, and with less than six minutes to play, the Giants advanced 92 yards. Conerly threw twice to HB Randall Clay, for 37 and 20 yards, and finally it was Conerly tossing a short pass to Roberts, who ran the remaining distance untouched for a 39-yard touchdown. Poole converted once more to put the visitors ahead by four points. There was still time for the Redskins and HB Frank Spaniel returned the ensuing kickoff 40 yards to the New York 49. But after advancing to the 35, FB Chuck Drazenovich fumbled and the Giants recovered to seal the 21-17 win. The statistics reflected the closeness of the contest. New York had the edge in total yards (288 to 260) while the Redskins led in first downs (18 to 15). Both teams completed seven passes apiece, with the Giants having a 168 to 105 edge in yards, and Washington outgained New York on the ground by 155 yards to 120. However, the Redskins turned the ball over three times, to one by the Giants. New York lost two of its next three games but didn’t lose another on the way to a 10-2 record that tied with the Browns atop the American Conference (the re-named Eastern Division). But after sweeping Cleveland in the season series, the Giants lost a tight 8-3 playoff to the Browns. As for the Redskins, the loss to New York was the third of eight straight (including the rematch between the teams). Washington ended up 3-9 and at the bottom of the conference.